This Demonstration studies enriching the oxygen content of air with a single-stage membrane module. This problem was first treated in  and later in . The binary mixture, (oxygen) and (nitrogen), has an ideal separation factor, the ratio of the permeabilities of the two species, . The permeability of oxygen is ). The membrane is more permeable to oxygen and has a thickness . The stage cut, , is set by the user. The values of the pressures in the feed and permeate sides are chosen equal to cmHg and cmHg, respectively, which give a ratio of pressures, , equal to 10. The feed rate and composition are given by: , and . 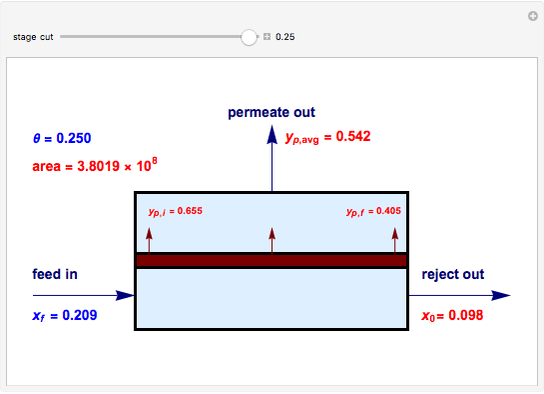 This Demonstration computes the reject and permeate compositions as well as the membrane area. In addition, values of the local permeate compositions, both at the entrance and exit of the module, are given. Ahmed Bellagi "Enriching Oxygen in Air by Cross-Flow Membrane Permeation"